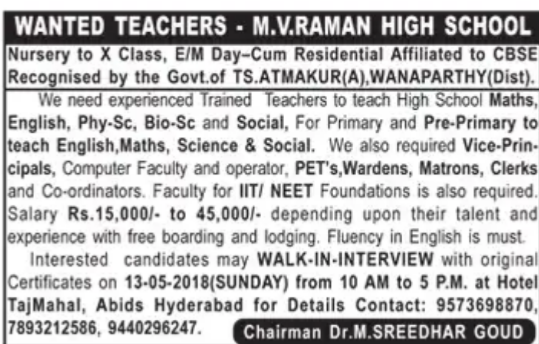 M.V.Raman High School, Wanaparthy has advertised in THE DECCAN CHRONICLE newspaper for recruitment of Teacher jobs vacancies. Interested and eligible job aspirants are requested to walk-in on 13th May 2018. Check out further more details below. 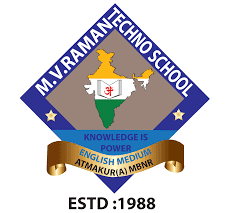 Name of the School :M.V.Raman High School, Wanaparthy. About School: MV Raman Techno School was instituted on 14th June, 2000 by the educational luminary, Sri Sridhar Goud. He has to his credit over thirty years of experience in the field of education and has established schools and colleges that have gained formidable reputation in the twin-cities. 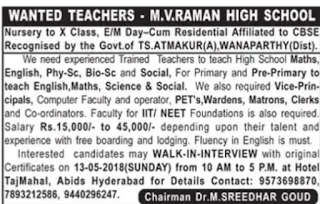 It was his passion for education that inspired him to establish MV Raman Techno School.Presently, MV Raman Techno School has two branches, one at Atmakur and the other at Mahabubnagar. Our third new branch at Mahabubnagar will start functioning from the coming academic year i.e 2013-2014. Both schools offer excellent facilities and sound infrastructure that includes audio-visual library, science labs, computer labs etc. The teachers are well trained, experienced and teach with dedication and zeal. Rs 15,000 -45,000 depending upon their talent and experience with free boarding and lodging. How to apply: Interested candidates may attend interview with originals 13-05-2018,10a.m to 5 p.m at Hotel Taj Mahal, Abids Hyderabad.